This Floating heel protector is designed to elevate the heels and offset pressure to heal and prevent bedsores. Medical pressure relief foam is soft and comfortable allowing the patient to suspend the heels to prevent sheering and friction. The soft breathable low sheer stretch cover prevents friction and reduces heat and moisture. The soft convoluted foam top evenly and comfortably positions both legs. The slip resistant bottom prevents sliding. Can be used with foam or air mattresses. 24 x 16 x 7 x 5-1/2"
This Floating heel protector is designed to elevate the heels and offset pressure to heal and prevent bedsores. Medical pressure relief foam is soft and comfortable allowing the patient to suspend the heels to prevent sheering and friction. The soft breathable low sheer stretch cover prevents friction and reduces heat and moisture. 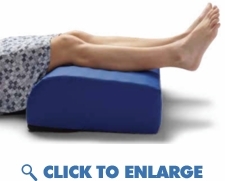 The soft convoluted foam top evenly and comfortably positions both legs. The slip resistant bottom prevents sliding. Can be used with foam or air mattresses. 24 x 16 x 7 x 5-1/2"